Cities and coastal areas are on high alert as Typhoon Nida makes landfall in southern China, sweeping through Hong Kong. HONG KONG (AFP) – Hordes of angry passengers stranded after Typhoon Nida pummelled Hong Kong crowded the airport on Tuesday (Aug 2), desperately seeking flights as the city emerges from lockdown while the storm swept across southern China. Hundreds of flights were cancelled, schools and shops shut and the stock market closed for the day as the storm brought violent winds and torrential showers. Gusts of 151km per hour whipped the city and rain lashed down during the night, leaving three people injured and a trail of fallen trees and torn-down scaffolding. The storm triggered a Typhoon 8 signal – the third-strongest category – which was taken down a notch around midday Tuesday as winds eased and the typhoon passed onto mainland China. But as the city’s deserted streets began to come to life as buses and train services resumed, Hong Kong’s Chek Lap Kok airport was inundated with stranded passengers. An airport authority spokesman told AFP only 500 flights would run between 6am and midnight local time on Tuesday (2200 GMT on Monday to 1600 GMT). On a normal day, the airport would handle 1,100 flights. More than 150 flights were cancelled Monday as Nida approached, leaving stranded passengers to sleep on the floor in the departure hall. Hong Kong’s flagship carrier Cathay Pacific and its subsidiary Dragonair cancelled all of their flights in and out of Hong Kong for 16 hours, from 10pm Monday until 2pm Tuesday. Security guards prevented passengers without flights from reaching check-in desks Tuesday, redirecting them to another part of the airport to seek help from staff. Some complained that airline staff had not given them food vouchers or emergency accommodation despite lengthy waits. “The airline was giving inconsistent information. There was no announcement whatsoever about accommodation, food or the weather situation. It’s chaotic,” one passenger told local channel TVB. Another passenger from the Philippines told AFP he had not been provided with food or accommodation, despite being at the airport since 7pm Monday. His flight has been rescheduled for 10pm Tuesday. 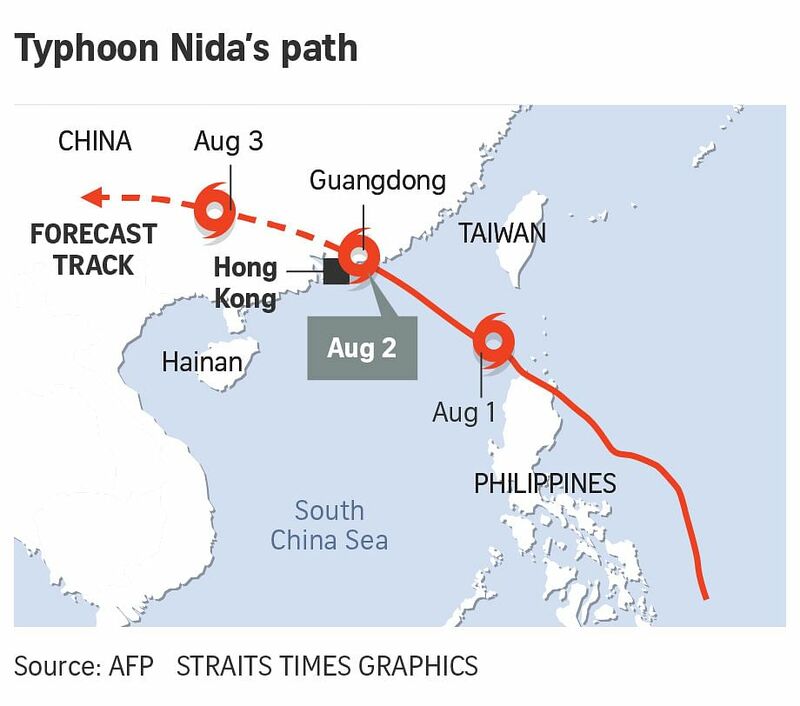 After sweeping past Hong Kong, Nida made landfall early Tuesday in the southern Chinese city of Shenzhen, with winds still blowing at up to 151 km per hour. Shenzhen issued a red alert over rain – the highest in a four-tiered warning system – after the downpours reached more than 80mm, China’s meteorological bureau said. The city’s port and the Shenzhen Bay Bridge connecting the mainland to Hong Kong were temporarily closed, CCTV said, with around 140 flights cancelled at its airport. In neighbouring Zhuhai, rainstorm warnings were upgraded to orange, the second-highest alert level, on Tuesday. Work was cancelled, scenic spots closed and city bus services stopped, the Guangzhou Daily said. Nida brought strong winds and torrential rains to the northern Philippines over the weekend, while southern China has already been hard-hit by storms this summer. Super Typhoon Nepartak left at least 69 dead in July in the amainland’s eastern province of Fujian – despite being downgraded to a tropical storm.